Realising that our New Season Seville orange marmalade stocks were running low, Phil decided to make some Blood Orange marmalade as they had just come into season. "I thought it would be a lovely marmalade; with lemon juice added to the Blood Oranges it couldn't fail!....But it did. I thought it had set and jarred it all up. The next day it was still gloopy, so I emptied all the jars (28!) back into the pans and tried again. Even with the addition of more lemon juice and some pectin and definite wrinkles when set-tested, the next day it had still not set - but now it was as dark as treacle (tasted gorgeous mind you)." Phil decided to substitute the marmalade for the sugar and lemon in his usual Lemon Polenta Cake and use some of the marmalade as a glaze/drizzle and hey presto a new star was born. Blood Orange Marmalade Polenta Cake - £1.85 a slice (a big slice). 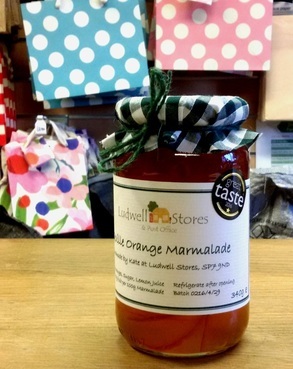 Our award-winning Seville Orange Marmalade, available now, is made only with Seville oranges, sugar and a touch of lemon. It is a traditional tangy bittersweet taste of sunshine on your toast, a trusted way of brightening up your January. Another Great Taste Award winner. Rich, densely chocolatey and fudgey, with chunks of Belgian milk and white chocolate to add contrast to the squelch. Freshly made weekdays. Egg & Cress, Ham Salad, Ham & Mustard, Cheddar Ploughman, Cheddar & Chutney, all on malted wheat bread. Another favourite - balancing lemony acidity with buttery unctiousness. A simultaneously sharp and rich cake. Available most days. Well, we can't believe it! If there is something you want that we don't stock, we will do our best to find it and put it on the shelf. If it proves popular enough we will reorder it; again and again. Yes, we offer a Dry Cleaning, Laundry and Repairs service, which is collected/delivered twice a week (very early Tuesdays and Fridays). Our cleaners are long-established and provide a very professional service.